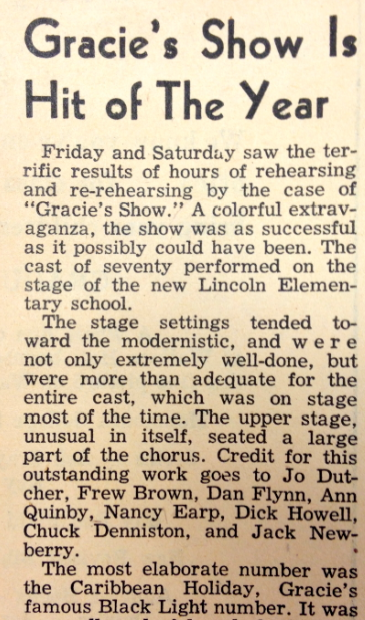 One of Gracie's most popular shows in the 1950s was "Town Topics," which debuted on May 29, 1953 at Lincoln Elementary School in Monmouth, IL. Gracie developed and directed the musical, which featured numbers that were inspired by themes of conversation around town, including vacations, fashion, and the college centennial. The opening act of the show featured music from "The King and I," and some of the following performances included Don Hewes, who sang "On the Sunny Side of the Street," and H.A. Loya, William Mays, and Lyle Bollinger who played "Where is My Heart" from "Moulin Rouge." The show received rave reviews from the local papers. During her tenure at Monmouth College, Peterson was known not only for her ability to direct incredibly entertaining shows, but also for her ability to draw crowds from all over midwestern Illinois, building a rapport between the college and the community of Monmouth. 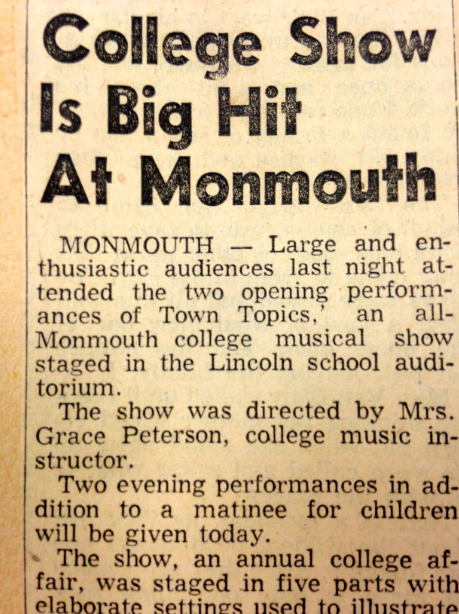 An article from 1953 praising "Town Topics" and describing how there was "never a dull moment" on stage. 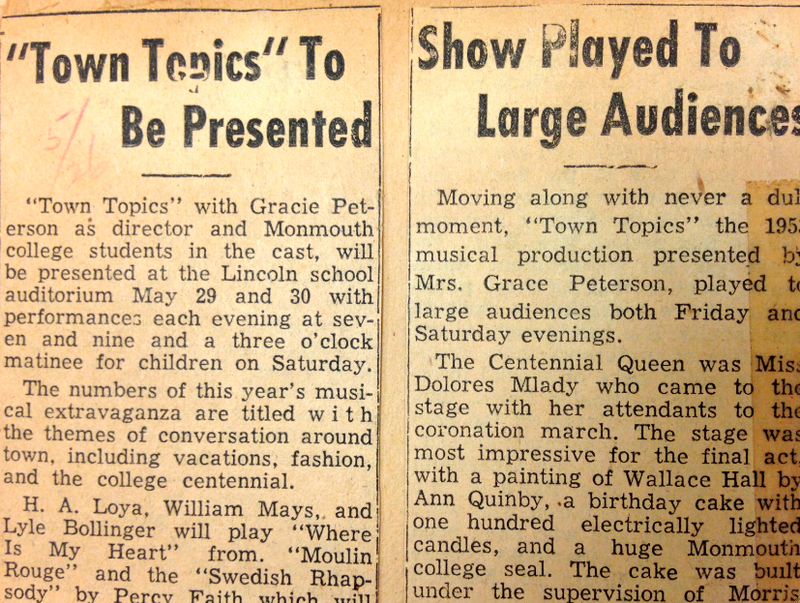 "Town Topics" admitted adults at 75 cents and children at 25 cents during its run at Lincoln Elementary. 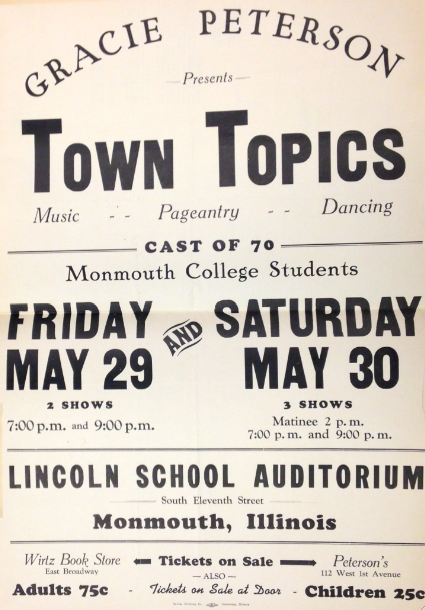 Newspaper Review of "Town Topics"
A 1953 poster for "Town Topics" advertising the cast, dates, times, and location of the show. As seen in this newspaper clipping from 1953, "Town Topics" was a huge success with viewers.